Join us as we celebrate our 96th Annual Training Institute. Water Park in Pocono Manor, PA.
POWER UP! - Wellness for your body, mind and soul in today's correctional environment. of what and how to make the needed adjustments in today's world. You will receive an invoice after your registration is complete via email, or pay by credit card using our PayPal option. Cancelations that are made after April 20, 2017 will be charged a $35 cancelation charge. Any cancelations after April 30, 2017 will NOT be refunded. Visit the link(s) below for details. Please follow this link for information regarding our listing of speakers and workshop presenters! and $394.00 (quadruple occupancy) if reservations are made before April 15, 2016. The price of registration includes passes to the indoor water park. PLEASE NOTE: Hotel reservations and payment are separate from the conference registration. Payment for accommodations should be made directly to the hotel. 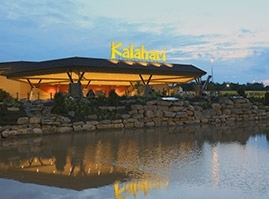 All overnight attendees of the conference are required to stay at The Kalahari. This year the proceeds will be donated to the Ronald McDonald House of Scranton, PA. Funding enhances the ability of the Ronald McDonald House to provide a home away from home for families with seriously ill or injured children in area Medical Facilities. They have been providing these programs for over 30 years since a group of community leaders came together to open the Ronald McDonald House in Scranton in 1986. McDonald’s is a partner in care and provides, through local donations, about 10% of our operating budget. The other 90% comes from gifts from individuals, corporations, organizations and foundations who support our mission. We are requesting a donation from you to auction at our event, which will be held on May 23, 2017. The item(s) can be mailed to the address below or can be picked up by a board member who is located in the area. If you wish to drop items off locally, please contact us. A sincere “Thank You” is extended to those who donate items for this worthy cause. Please review the attached nomination form for definitions of award categories and nomination criteria. PAPPC believes it is essential to honor individuals who have made significant contributions to Pennsylvania’s Criminal and Juvenile Justice Systems. Please take this opportunity to nominate someone for these awards. Nominations must be postmarked by April 15, 2016. Award winners will be honored at the PAPPC 96th Annual Training Institute; Awards Luncheon & Annual Business Meeting on Tuesday, May 23, 2017. We offer a wide variety of sponsorship opportunities and the chance to interact with multiple staffing levels in the fields of Probation, Parole and Corrections from front line Agents and Officers, mid management supervisors to Chiefs, Wardens and Executive and Senior staff. If you are interested in being an exhibitor at our conference please use the registration link above. If you would like to see a listing of available sponsorship opportunities please: CLICK HERE. If you have specific questions for our vendor relations committee: CONTACT.